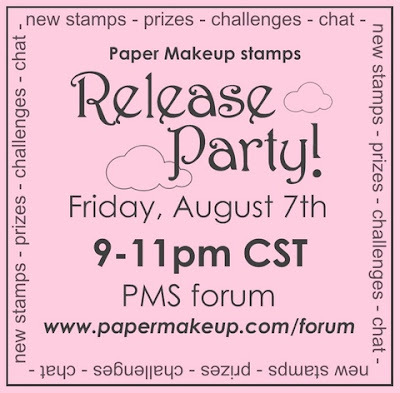 Paper Makeup Stamps: Freebie Friday! And let's begin the blog hop! Here is your Friday Freebie! I really love this quote. I'm a thinkin' this one will be a rubber at some point. :D But for right now it's your digi freebie! Its available as a PNG file so it can easily be used in digi scrapping but if you need a jpeg version and arent sure how to resave it as a jpg, just shoot me an email and i'll get the jpg to ya! Go HERE to download this file! 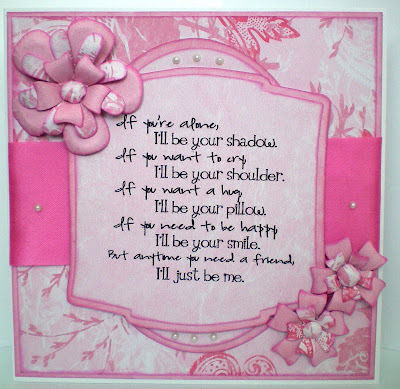 The ever fabulous Dawn Wheeler made this fantasticly pink card using this freebie! I love how she layered the nestabilitie labels 2 die with (i think) a circle. It makes it look like a whole new die! And her flowers are fantastic as always! 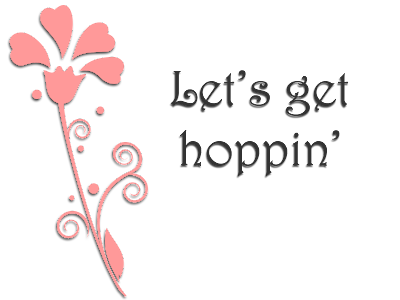 I have a sneaking suspicion that you'll see more of this wordart today as you do the blog hop. Some of the gals will have 2 posts too... so ya may want to pay attention just to make sure you dont miss anything! Just a reminder... each design team member will have a letter for you. Put these letters together to get your 15% off all new releases (including the digi to rubber releases). How to WIN! 1 Lucky winner will receive a special $35 gift certificate towards any stamp purchase!!!! You can use it on new stamps or previously released stamps (but on stamps only, please) How do you win? Just leave a comment. 1 design team member has the lucky blog. And a comment will be drawn from their blog to win. You dont know who's blog it is... so you just might want to leave a comment on them all! Want more ways to win?! Who doesnt! This is a pretty hefty release, so we're doing some pretty hefty prizes! We're going to let you in on some secrets... our release party challenges! If you can play today, all cads uploaded to the forum today are entered to win additional 15% off vouchers (yep, thats in ADDITION to the 15% voucher you get by going thru the hop!). If you cant play today, thats ok, we'll still draw some winners next friday. You can add more – this is just to get started. The number of layers of “makeup” you use is up to you, as well as the color choices. PMSRP13 - “I’ve got a CASE of PMS”. CASE a card in the “PMS” gallery of SCS and changing at least 2 things. Come and play with us tonight in the FORUM. We'll be chattin' it up, playing some games more chances to WIN! :) Stamps will go live on the site at 9 CST. Ok, now hop on over to Christi to check out this fab team's creations! Fabulous quote and the card is stunning. Whooo Hooo! It's a fabulous and inspiring blog hop. Better go refill my coffee and get a hoppin. Thanks for a chance. I love that sentiment! Thanks for the freebie! 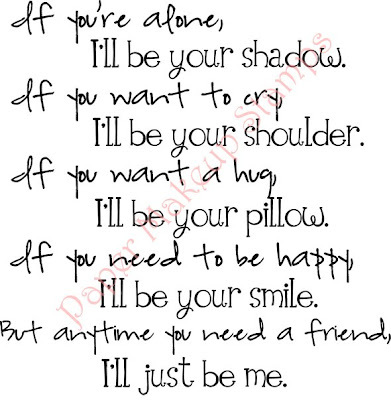 You know I love this and ALL the word art girl!!!!! Can't wait for tonight. Great quote! Dawn's card is fabulous! I love those flowers! Thanks for the freebie!!! I LOVE this quote (I used it on an altered pic for my DH a few years ago). Beautiful card!! What a beautiful card! I'm off to start hopping! Thanks for the freebie and what a lovely card. Thank you so much for this Freebie. I want to let you know that I posted a link to your blog in Creative Busy Hands Scrapbook Freebies Search List, under the Alpha(s),Font(s), Word Art(s) post on Aug. 07, 2009. Thanks again. sounds like you've planned another great party!! i have to work tonight - but maybe i'll get home for some of it! Wahoo for blog hops and freebies. Gorgeous card! love the freebie and the knowledge of the challenges early might actually get a chance to get them done. It depends on how my little man is feeling throughout the day. Thanks so much for the freebie. Now I am off for the hop. Thanks for a fun Friday. What a great freebie! I'll try to show up tonight! Fabulous quote!! Looking forward to the release party tonight! Missing my PMS peeps! What a great quote & love your card! Thanks for all of the great chances to win. Katie thanks for nice quote on beautiful card.